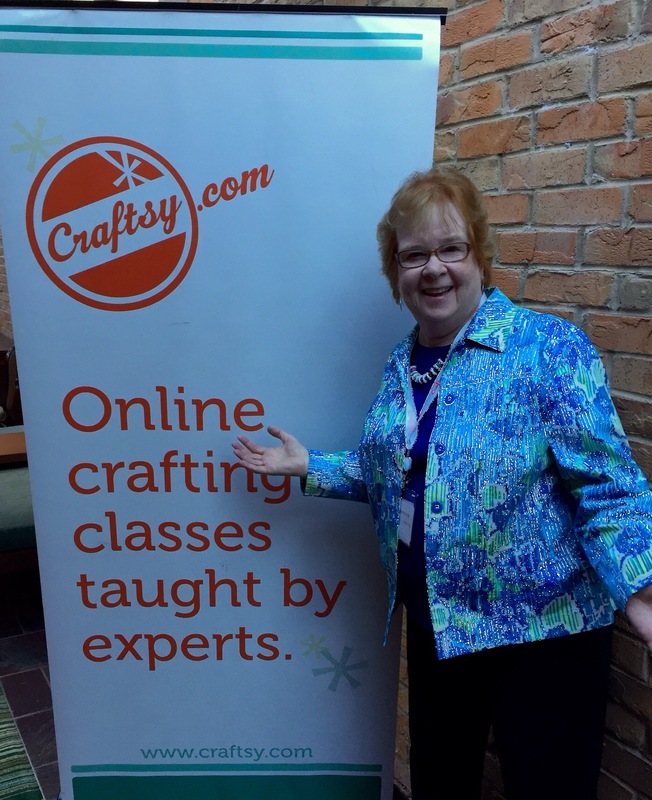 While the snow piled up in Baltimore, and everyone else is posting deep snow photos, Bob and I traveled to Denver to the Craftsy Instructors’ Summit, a weekend of amazing presentations teaching us about the company. 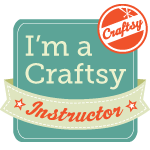 We learned Craftsy’s story, met the young men who had this vision to create an on line platform for excellent craft classes, and shared ideas with 200 instructors. We learned new ways to communicate through social media and got a peek into the future of this wonderful company. I’m still in Denver and my head is spinning with new ideas it was a fabulous, creative, and super well-planned event! Sew every once in a while, a quilter gets blocked. So do artists and writers and anyone who creates stuff they love. This quilter has been blocked last year. It’s been a busy fabulous year, but it’s been hard to make something new. I’ve been catching up on my classes, making samples, and I spent the first half of the year getting ready for Celebration…finishing quilts, labeling quilts, making hanging sleeves, and making sure it was all ready. I’m not complaining, I’m just setting this up. So when this happens to artists, they are told to Play. That means paint for the fun of it all, for the experience of color, to get things moving. In the movie Finding Neverland, J.M. Barrie talks about the fun of writing for the stage…that’s why they call it Play! So here I am at the beginning of a new year and I realized that’s what I’ve been doing….Play! A friend invited me to the Baltimore Symphony…what a fun night as the wonderful conductor led us through the Four Seasons. I took my DIL and Granddaughter to the theater to see The Secret Garden. What a delightful afternoon of music and scenery and play! And my friend Joan who designs with flowers, helped us make table decorations for the holidays. It’s fun to experience what other artists do. In a quilters world, it’s just fun to sew. This is Play of the best kind! My friend Laurie calls it Sewing Your Brain Out. I’ve made some quilts this fall simply because I wanted to just sew pieces together. You will see these quilts soon! Sometimes you need help when you are blocked. In a quilters world, this might mean shopping for a new piece of fabric, or asking for help with color, or as we call it, Quilting by Check! That means asking a professional quilter to quilt for us….quilting the three layers of fabric together to complete a quilt. A couple weeks ago, I took four quilt tops to be quilted and they came back finished. Suddenly, the fabrics I’ve been playing with became real quilts! 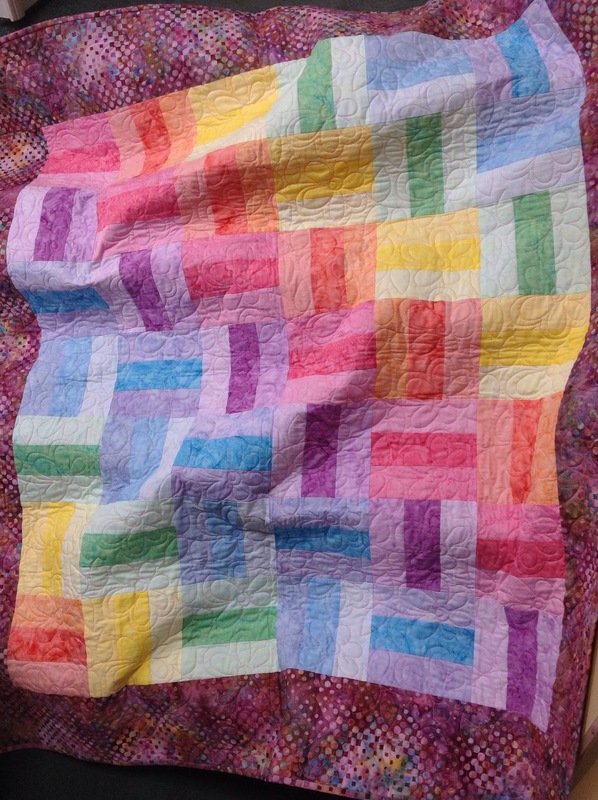 Here’s one of them…I love the flowers quilted over the strips of color. I will share the others later. Craftsy.com is having a sale today! They have lots of sales but this one is different! It’s 50% off the top five classes in each of their class categories! What a great deal! You get to check out the most popular classes and you get a great discount! 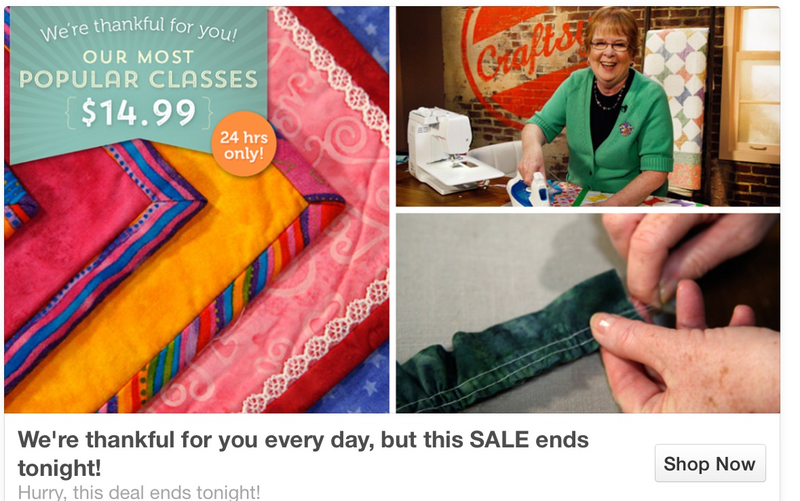 So I had a fun surprise….my Finishing School class is in the top five in the Quilting category! Hooray! Just in time to help quilters finish their quilts for Christmas! You need this! I had this strange feeling yesterday…..I was caught up on sewing things that had to be done, classes that had to be organized, and emails that had to be answered. 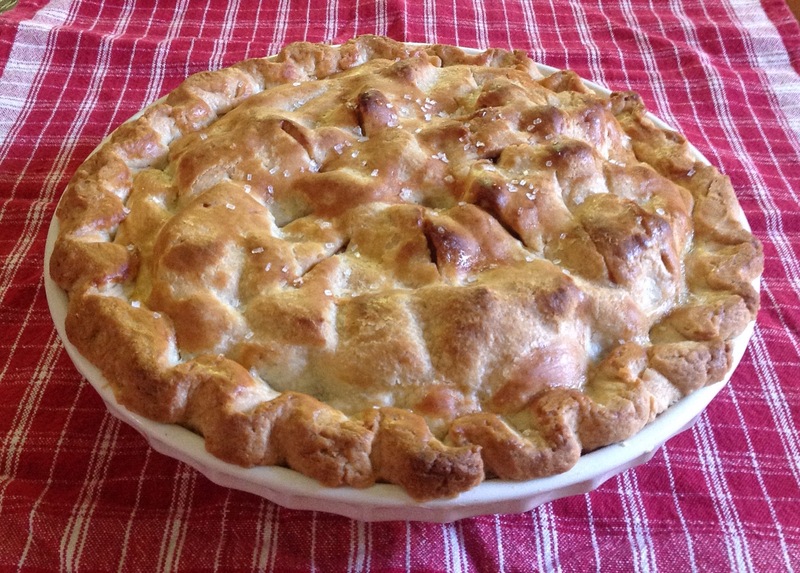 I had time to enjoy making an apple pie! So I did…enjoy it, that is! And Bob and I both enjoyed eating it! With ice cream! Yum! Sometimes it’s just the simple things in life that are important! Sorry, it will be gone by the time you read this! After a fun trip to three Halls of Fame, after a long ride back to Baltimore, the one thing that stands out is…. There’s no place like home! It’s ruby slipper time! Even if it’s rained ALL week, even if the Orioles aren’t in the playoffs, even if I went to bed before the Ravens won against Pittsburgh, even if Maryland lost another football game, I’m back in my happy place! My Grad School class meets tomorrow and life is good! 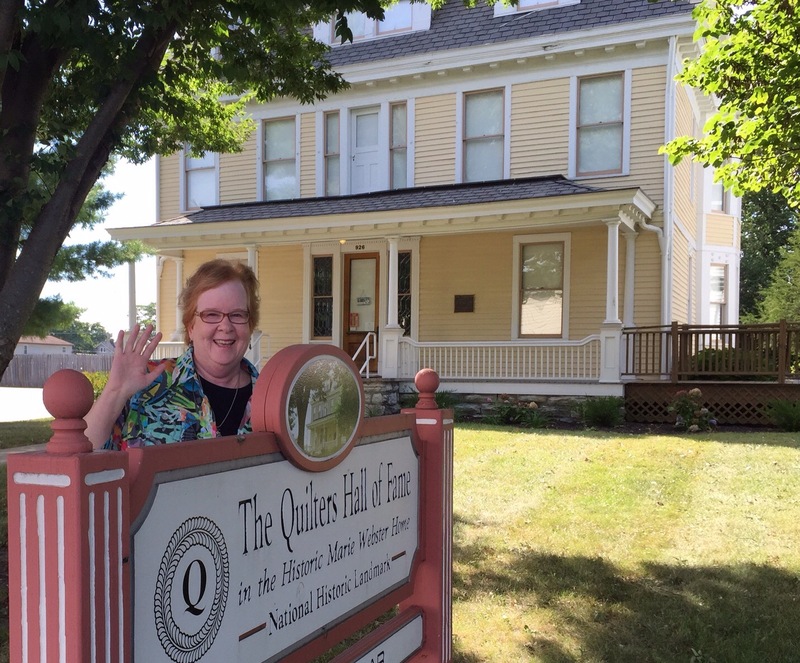 And on the third day we arrived at our personal favorite HOF….The Quilters Hall of Fame! 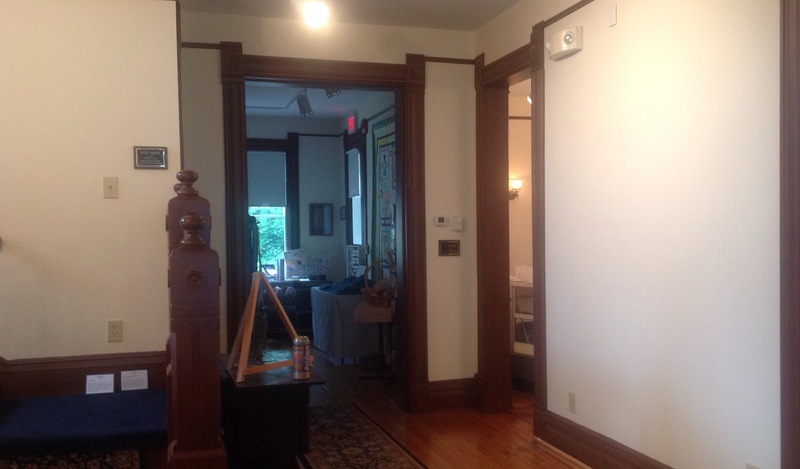 I just wanted to be in the house one more time with my quilts hanging there. It’s an amazing feeling to see them in the galleries. It was a fun two days, just being there again and visiting with Deb, Tina, and Debi. We had ice cream, ate dinner at a fun restaurant, and I taught a Saturday workshop for the Marie Webster Quilt Guild. After the workshop, we took my quilts down so that I could bring them home. 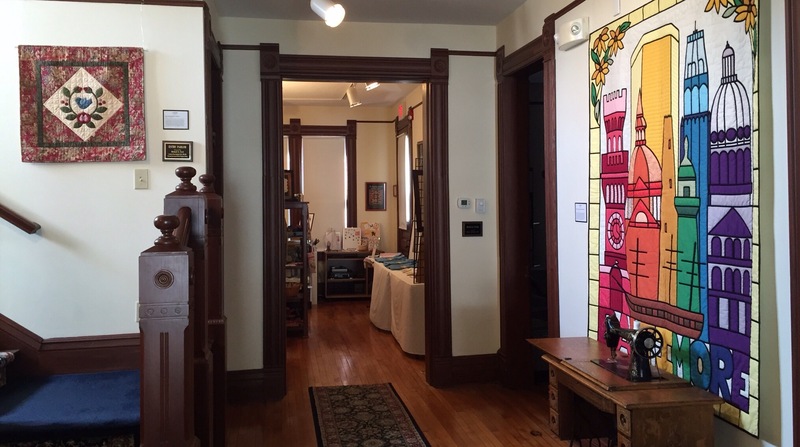 We left the house ready for a new exhibit…..of modern quilts! It’s been a fabulous summer. On our way home, we drove ten hours from Marion Indiana to Baltimore with a car full of quilts. We stopped at Starbucks in the late afternoon and the young barista saw my “quilty” shirt. She told me she is taking a quilt class starting this week. It made me feel so good to meet a young woman excited about starting her first quilt! The Pro Football Hall of Fame……Canton Ohio. 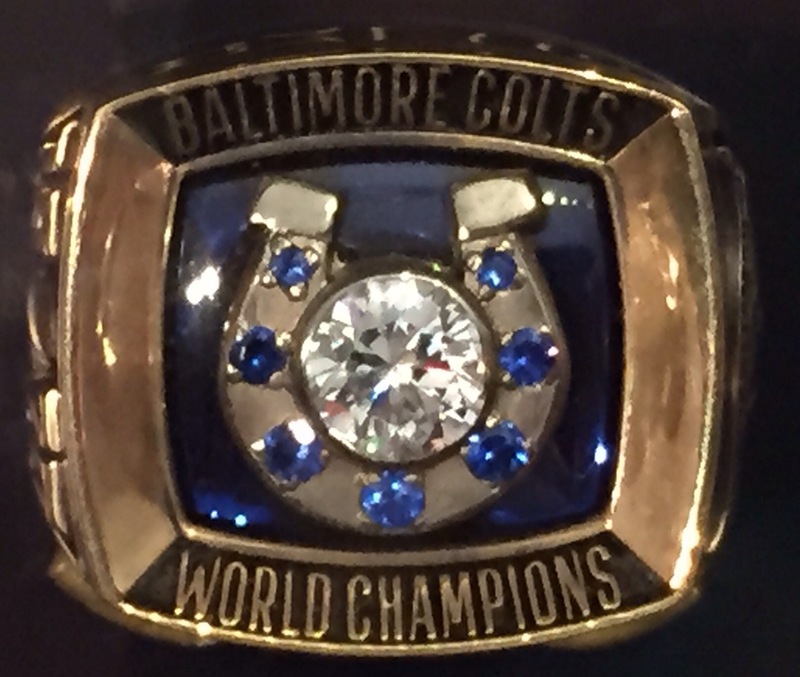 We were so close….we had to go pay homage to the great Johnny Unitas and the Baltimore Colts! 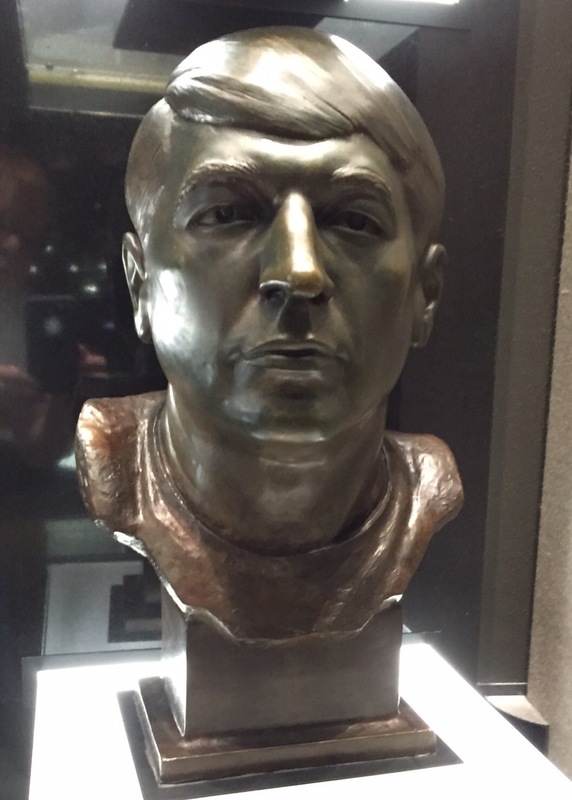 Each player in the Football HOF has a bust. It was very quiet in that area, as people walked around looking for their favorite players. Many of the noses were shiny, so we rubbed Johhny U’s nose for good luck! My absolute favorite part was the display of championship rings. We met a fabulous lady who knew everything about all the rings. She loved showing us the Baltimore Colts ring from Super Bowl V.
And the Baltimore Ravens rings. 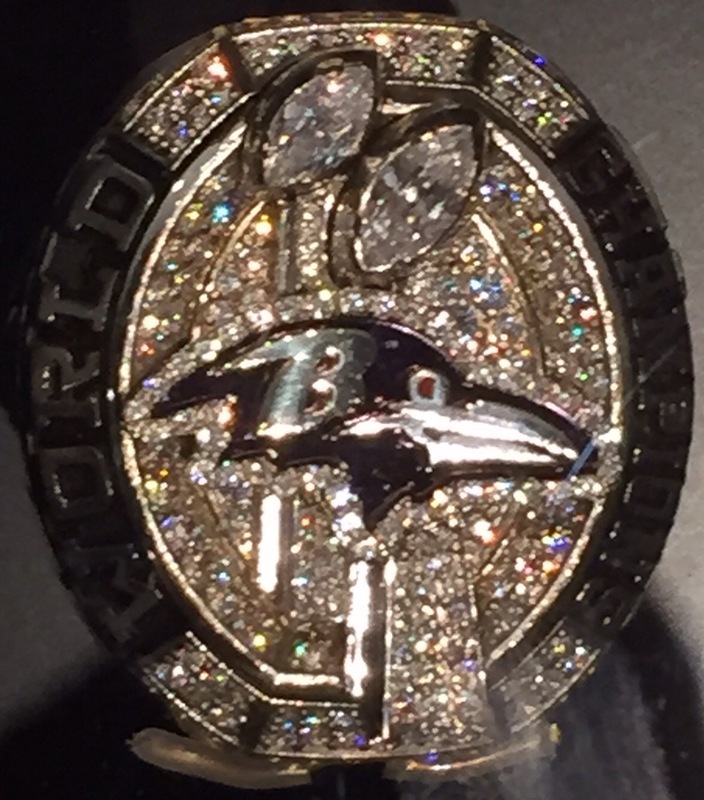 This is their second one….see the two big diamonds shaped like the trophy? The diamonds! The stories! The incredible size! Loved them all….or almost all of them! What a fun trip! All that Play Pays Off! Playing with a Layer Cake!